“Some of us are Norman Mailer,” said Ursula K. LeGuin in a 1976 interview with science-fiction fanzine Luna Monthly, “but others of us are middle-aged Portland housewives.” And though Le Guin may have thought of herself as one of the latter, “middle-aged Portland housewife” is hardly the way the rest of us would describe her. Over a nearly 60-year-long career, Le Guin produced an enormous body of literary work, including but not limited to the six books in which she created the world of Earthsea and other acclaimed sci-fi novels like The Left Hand of Darkness, The Dispossessed, and The Lathe of Heaven. And somehow she managed to write all of it between 7:15 a.m. and 1:00 p.m. each day. Or that’s what her ideal writing schedule dictates, anyway. 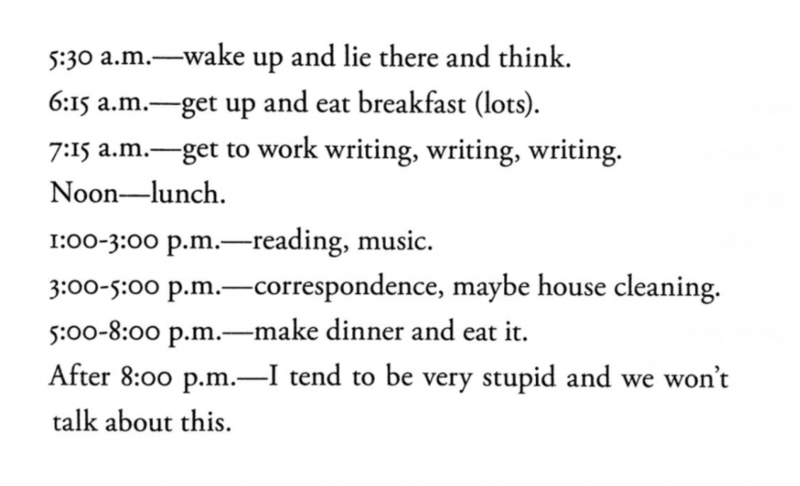 Recently tweeted out by writer Michael J. Seidlinger as “the ideal writing routine,” it first appeared in an interview she gave in 1988 (and more recently reappeared in Ursula Le Guin: The Last Interview and Other Conversations). Beginning at the early hour of 5:30 in the morning, the time to “wake up and lie there and think,” it continues on to breakfast — and “lots” of it — at 6:15, and the commencement of the day’s “writing, writing, writing” an hour later, which lasts until lunch at noon. 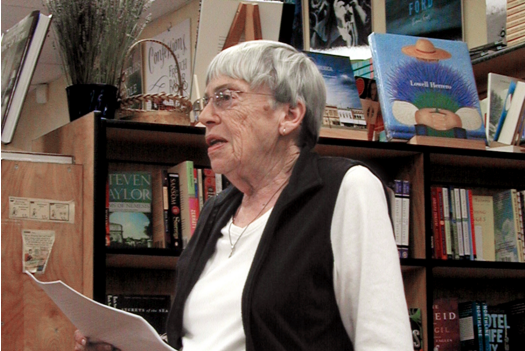 After that, Le Guin considered what we consider her main work to be done, moving on to such pursuits as reading, music, correspondence, “maybe house cleaning,” and dinner. Past 8:15, she said, “I tend to be very stupid,” a state in which nobody could write the sort of books we remember her for. But however originally she wrote, Le Guin was hardly exceptional in living this way while doing it. “Be regular and orderly in your life, so that you may be violent and original in your work,” said Gustave Flaubert, a maxim true for enough writers that we also worked it in when we featured an infographic on the daily routines of famous creative people. In both Flaubert and Le Guin’s case (or in the case of a writer like Haruki Murakami, who rises famously early and runs famously hard when working on a book), their domestic lives, well-ordered to the point that an outside observer would find them boring, facilitated the creation of literature like none that had ever come before. This despite the fact that, on the surface, few novels could seem more dissimilar than Flaubert and Le Guin’s, but each writer would have seen what the other had in common: specifically, that they knew what it took to get the imagination well and truly fired up. Ursula K. Le Guin’s Daily Routine: The Discipline That Fueled Her Imagination is a post from: Open Culture. Follow us on Facebook, Twitter, and Google Plus, or get our Daily Email. And don’t miss our big collections of Free Online Courses, Free Online Movies, Free eBooks, Free Audio Books, Free Foreign Language Lessons, and MOOCs.